KABUL (AP) — Lost and alone in a strange city Mariam called the only person she knew, her husband's cousin. She worried he wouldn't help her because she had left her home in Afghanistan's northern Kunduz province, fleeting to the capital Kabul to escape his relentless and increasingly vicious beatings. But he promised to help. Too busy to come himself he sent a friend who took her to "some house", held a gun to her head and raped her. Finished with her he settled in front of a TV set, the gun on a table by his side. Choosing her moment, Mariam picked up the gun shot her assailant in the head and turned the gun on herself. "Three days later I woke up in the hospital," she said, slowly, shyly removing a scarf from her head to reveal a partially shaved head and a long jagged scar that ran almost the length of her head where the bullet grazed her scalp. 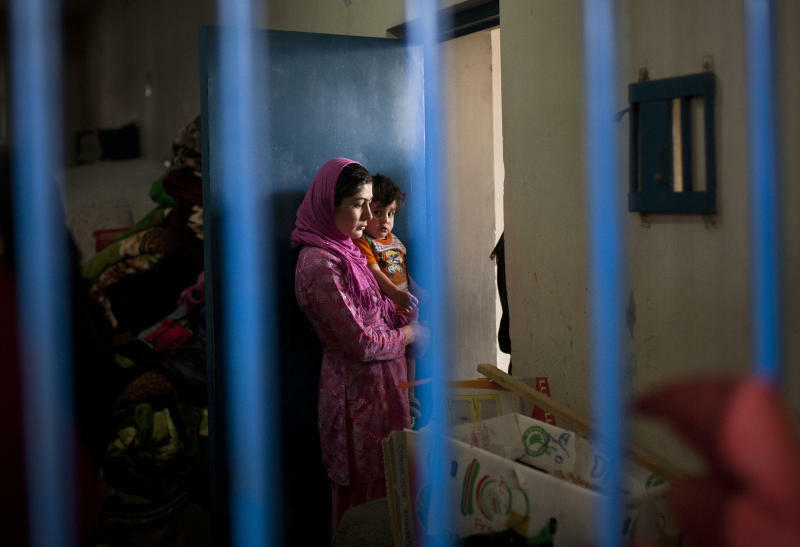 From the hospital Mariam was sent to a police station and from there to Badam Bagh, Afghanistan's central women's prison where she told her story to The Associated Press. For the past three months Mariam has been waiting to find out why she is in jail, the charges and when she can leave. "I haven't gone to court. I am just waiting." Hugging a ratty brown sweater to protect her from the damp cold of the prison, Mariam is one of 202 women living in the six- year- old jail. The majority of the women packed are serving sentences of up to seven years for leaving their husbands, refusing to accept a marriage arranged by their parents, or choosing to leave their parent's home with a man of their choice __ all so-called "moral" crimes, says the prison's director general Zaref Jan Naebi. 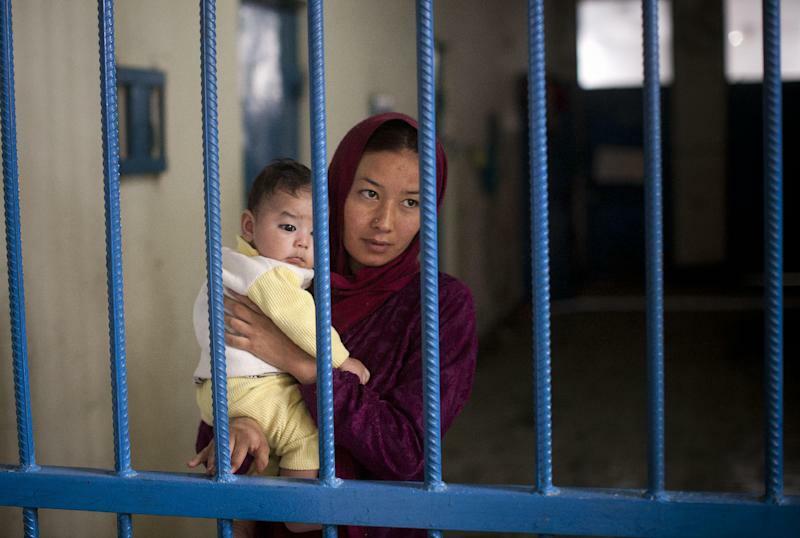 Some of the women were jailed while pregnant, others with their small children. Naebi says there are 62 children living with their imprisoned mothers, sharing the same grey steel bunk-beds, napping in the afternoon hidden behind a sheet draped from an upper bunk, oblivious to the chatter and the crackling noises from the small fussy television sets shoved off to one side of the rooms. The Taliban were thrown out 12 years ago ending five years of rule and regressive laws that enforced a tribal tradition and culture more than religious compulsions denying girls schools, ordering women to stay indoors unless accompanied by a male, and in some of the more severe cases even blackening the first story windows so prying eyes could not see women within. Women were forced to wear the all- encompassing burqa or suffer a public beating. In the first years after the Taliban's December 2001 removal strides seemed to be made for women, schools opened, women came out of their house, many still in the burqas but appearing on television and getting elected to Parliament. But women's activists in Kabul say within a few years of the Taliban's ouster the ball was dropped, interest waned and even President Hamid Karzai began making statements that harkened back to the Taliban rule saying women really should be accompanied by a man while outside their home. A new law was enacted called the Elimination of Violence Against Women (EVAW), but its implementation is erratic and rare, says the United Nations Assistance Mission on Afghanistan, whose human rights arm monitors such things. An UNAMA report issued in December last year says it is difficult to even get information about violence against women from the authorities partially because they don't want to look bad if it showed that little was being done and little, if any, official documentation on violence against women exists. While it might not be against the law to run away or escape a forced marriage, the courts routinely convict women fleeing abusive homes with "the intent to commit zina (or adultery)" which are most often simply referred to as "moral crimes," says the report. "Perceptions toward women are still the same in most places, tribal laws are the only laws followed and in most places nothing has changed in the basics of women's lives. There are policies and papers and even laws but nothing has changed," said Zubaida Akbar whose volunteer Haider organization fights for women's rights and sends lawyers and aid workers to the women's prison to defend the inmates in court. In the overwhelmingly male dominated legal system, Akbar said even when an inmate gets in front of the judge, "he says 'it is her husband, she should go back and make it work. It is her fault and not her place to leave him __ not in our society.'" Afghanistan remains a deeply conservative society, where men dominate and tribal jirgas still hand out rulings that offer girls and women to settle debts and disputes. Surrounded by a high fence topped with razor wire, there is one small patch of open space where children being kept with their mothers in Badam Bagh prison play. Nearby women hang out their laundry. The two story building is only six years old but already it is grimy and neglected looking. On balconies obscured by mesh and steel bars women sit and smoke. Naebi said inmates attend a variety of classes during the week, ranging from basic literacy, to crafts and sewing, with the intention of giving the women a skill once they leave the prison. Inside the stark building, six people often share a small room that is their cell. Three sets of bunk-beds line the walls. In some of the beds infants tucked under grimy blankets sleep while their mothers tell their story. Nuria, dressed in maroon colored clothes from head to toe, quieted her infant boy as she told of going to court to demand a divorce from a husband she was forced by her parents to marry. Defiant even in prison, Nuria said "I wanted to get a divorce but he wouldn't let me go. I never wanted to marry him. I loved someone else but my father made me. He threatened to kill me if I didn't." Nuria had pleaded with her father before her marriage, begging to marry another. "When I went to court for the divorce, instead of giving me a divorce, they charged me with running away," she said. The man she wanted to marry was also charged and is now serving time in Afghanistan's notorious Pul-e-Charkhi prison, one of the country's largest prisons, overcrowded and with a reputation over the last several decades of maltreatment. At the time she went to court Nuria didn't know she was pregnant. She gave birth to her son in jail. Although the baby is her husband, who has offered to have the courts set her free if she returns home, Nuria said she has refused. "He wants me to come home now because I have his son but I said 'no. I will wait until my sentence is up,'" in eight months, she said. Twenty seven year old Adia left her husband, a drug addict, seeking shelter with her parents. They wanted her to return to her husband, who followed her demanding she return. "Instead I escaped with another man but it wasn't a romance. I was desperate to get away and he said he would help me but he didn't he just left me. I went to the court. I was angry. I wanted him charged and my husband charged but instead they charged me and sentenced me to six years. I went back to court to appeal the conviction and this time I was sentenced to seven and a half years." Seven months pregnant, Adia will have her baby in jail. Fauzia isn't sure of her age. She looks to be early 60s. She stares out of the prison bars. Already seven years in jail, Fauzia will serve a 17 year sentence for killing her husband and her daughter in law. Expressionless she tells her story, rolls up her sleeve to display a mangled elbow where her husband had smashed her with a stick. She was his fourth wife. "I was in one room. I came into the next room and they were there having sexual relations. I found a big knife and killed them both." Zubeida, the women's activist, said despite what she calls a veneer of change, little is different for most Afghan women. "We have the appearance of everything, but when you dig in deep down below the surface nothing fundamentally has changed. It has been tough. It has been really tough," she said.